Our next Network Exchange is coming up this Sunday 30th September, and we’re looking forward to another afternoon with the lovely and creative people who make up the Network of Coney. An Exchange is an open, playful workshop for all kinds of artists and makers to share practice and ideas. It’s a chance to get to know each other – and to see the incredible range of work our Network make. Each person helps shape the afternoon, whether they’ve brought something to share, or just joining for the fun of it. There is something about being in a creative space that is so infectious, lighting bulbs in your head you had no idea existed. And once lit, the bulbs shine so brightly on ideas, hidden away waiting to take flight. As a creative still looking for words to describe my interactive art, which for now I would describe as a mix of technology, visual arts, theatre and African inspired stories, I am always on the hunt for creative spaces to feed my imagination. When I discovered Coney, and the Coney Exchange, networking afternoons, it was just the place I needed to surprise myself with what I could achieve. On my first Exchange, filled with nerves and a few minutes late, I was greeted by friendly and talented individuals. The environment was casual, with tea and biscuits on offer for all. We played some games to get everyone more comfortable before we began sharing our art. As this was my first Exchange, I wasn’t quite ready to share anything as I did not have a laptop, router, projector and the standard set of electronics I thought I needed to preview anything from my interactive show. But I was assured there was no pressure to share. Yet, after seeing the different stages of people’s ideas and how they were able to express them excellently using simple tools, I too was inspired to strip my play bare to its core, and present it without the help of technology. 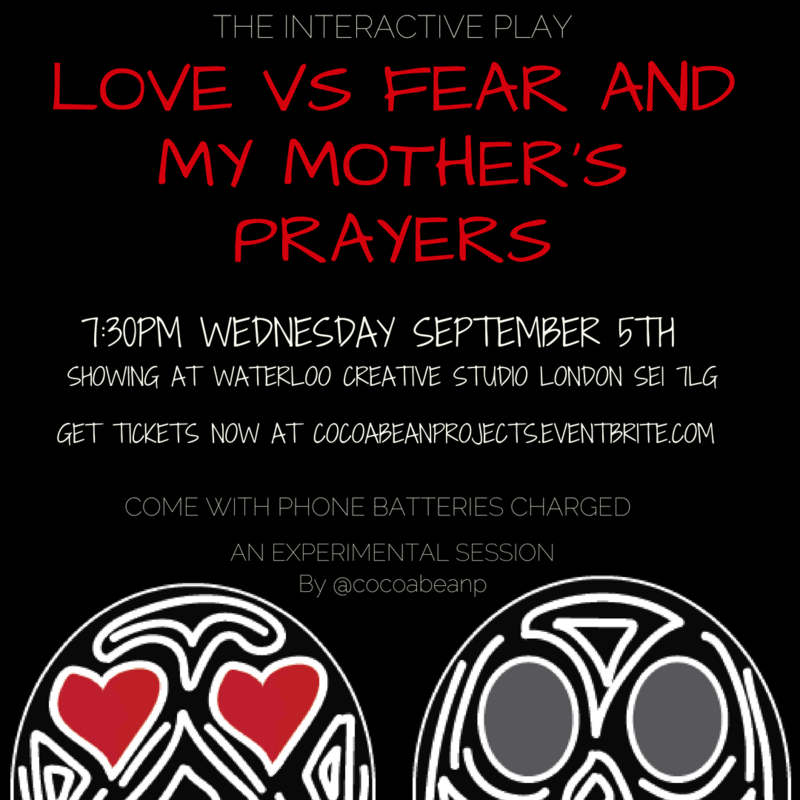 To give some context, my play is a new experimental interactive show called Love vs Fear and My Mother’s Prayers. It follows a young woman as she tries to follow her heart despite pressures from her pushy religious Nigerian mother. What makes the play even more unique is how technology is used to make the audience direct the play’s ending through the means of media content such as multiplayer games on mobile phones. So, you must wonder what would be the bare core of this play. So did I, then it came to me suddenly in the midst of fun activities and art expressed with pens, paper and body movements, that I could use cardboard and pens in the place of my projector, my phone as the audio system and good old fashion arm wrestling as a replacement of the multiplayer game. With these elements and a section of text from my play, I began preparing to share my art during the break. Although doubts like “would this even work?” crossed my mind, the environment at the Exchange was so patient, friendly and open to experimentation that I decided to go with it. And, to my surprise, the response was terrific. The feedback I got helped reaffirm that my art at its core when stripped bare was good enough and that no matter how the interactive content was delivered the concept was still enjoyed. This inspired me to push myself to show my work to a broader audience, which I did by putting on a showcase in September. And before the showcase, because of how helpful I found my first Coney Exchange, I was back again in this fantastic creative space that the Exchange offers, building a network of great artist, sharing and receiving inspiration, great feedback and encouragement. You can find out more about Bunmi’s work at cocoabeanprojects.com, read her personal blog here, and follow her on Twitter at @cocoabeanp. And if you’d like to try an Exchange for yourself, join us at the next one on Sunday 30th September, 12.30-5pm. Sign up for the Network here and give us a knock for details.